My name is Aryeh Cooperman. 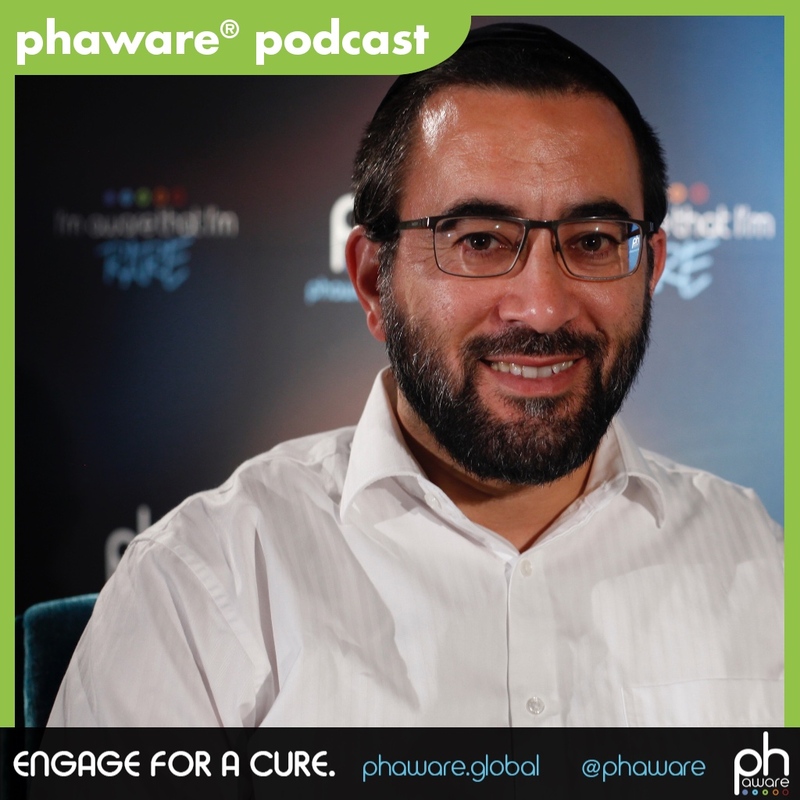 I'm the CEO of the PH Association in Israel, and I'm a caregiver of my wife. In Israel, most of the patients, nearly 100% of the patients when they came the first time to a physician and they had symptoms of PH, their physician told them that they are too nervous, that they have maybe problems with their husband, and they are too nervous maybe at work, and they just have to calm down and everything will be all right. The problem is because with PH, you can't really see it, only in an echocardiogram. Usually a young woman, nobody thinks that she has a problem in her heart. I always give an example of my wife and me. When she had the symptoms of PH for a few months, she went to her physicians, and nobody talked about PH. Everybody told her just to calm down, because they did the regular things, and they saw that everything is all right. Once I had a little bit of pains in my chest, it was the muscles, just the muscles outside of the heart. Immediately, I was in the hospital, and they gave me an echocardiogram, and they checked me, and they said everything was all right, so they kicked me out. My wife was [seeing doctors for] a few months, and nobody talked about giving her an echocardiogram, just because she is a woman. Nobody thinks a young woman would have a problem in her heart. She was pregnant and in her fifth month, and she had these symptoms. She couldn't go from one room to another one. Like I said, nobody thought that she has PH. Then one day, I told my mother about it and she immediately, as a physician's wife, thought that's weird, and she told my father. My father is a cardiologist. My father called me 11:00 at night, and he told me, "Tomorrow morning, you are in hospital." My father says [something], we do it. So, I sent her by herself. We didn't even think that it's something serious going on. They sent her out to the hospital. After two hours, I got a phone call, "You better come. There is something serious going on." They told me she has PH, and they have to stop the pregnancy in the fifth month because it's very dangerous to continue her pregnancy with PH. I myself saw a few patients in Israel that wanted so much to have a baby, and they got pregnant even though their physicians didn't allow them, and a week after their birth, they died. My wife stopped the pregnancy in the fifth month, which was very, very difficult. She was one month in hospital. It took her one year just to be able to go out in the car, not by foot, just in the car. An hour to Jerusalem and back to Tel Aviv without going out of the car, because she was so sick. It takes time to understand what's going on, and immediately we started to look out for physicians that really know all about PH. We had to change the hospital because the student hospital we were in didn't have experts in PH. We went to Beilinson to Professor Kramer, who's a well-known physician. He took care of us, and we started a trial. Afterwards, we took subcutaneous Remodulin, and that was very difficult for one and a half years. She was struggling, and we learned how to live our life differently and to understand that you can live. You can continue life but in slow motion. After my wife was diagnosed, we went to our organization. There was a PH Association already in Israel since 2000. My wife was diagnosed in 2005, so we went to this conference. They were asking for volunteers. I offered myself. After a year that I was volunteering, they decided that I would be good to be the Chairman. They voted. They voted me for being the Chairman. I was a Chairman of the PH Association for a few years, volunteering. After a few years, they decided that they want somebody to work for the PH Association and that would be much better for the PH Association. They decided to have somebody else be the Chairman, and I'm going to be the CEO. My role as a caregiver is to understand, to understand really what it is to be a patient because to be a patient with PH, I see a lot of people who don't understand it. It's really very, very hard. It's struggling every second, every breath. Breath is something that we don't even think about, and they think about every breath they have because every breath they have is difficult. Just bending or going to the other room, every little thing is very difficult for them. Going upstairs or just going up a hill, it's very, very difficult. If you understand what they are going through, you can help them. Like I said, if it's too difficult for them to go to the other room, you understand that, and you quickly do things for them so that they don't have to go to the other room. The main thing is really to think about them and to understand what are they going through. Then you can really help them. You struggle every day. You struggle every minute, and it's not easy to be a couple and to be a friend of somebody with PH. The main thing is to stop a few times in a day and to remember what they are going through, what they are struggling with, and to understand that a lot of what they say and what they behave is out of pain that they are struggling with. It's the pain and struggling with breath and struggling with not managing to do anything in life and not managing to have a normal life. That they are struggling with years. It's year after year. It's day after day. It's not something that like a sick person, usually a sick person is not a sick person because a sick person is sick for a few days and afterwards he has good days. They don't have a good day. They are struggling 24 hours, seven days a week, 365 days a year, all the time. It doesn't stop, that out of breath, out of breath, out of breath. You can't even imagine a thing like that, that a person all the time is out of breath. That really can make you crazy. I don't know how [my wife] manages, so when you think about it, you appreciate it, and you behave differently. Our association in Israel is one of the biggest ones in the world, that all the treatments are available in Israel. We call it the basket of health. The government pays for everything. Our association works very hard to make sure that all the treatments are available for patients and they're all in the basket of health, so patients have to pay about $100 a month. That's all for all the treatments, so we can have double treatments. Triple is not available officially, but if somebody needs it, they give it to them. A special thing that we have in Israel, we have a special project that we buy portable oxygen machines, concentrators for patients that 24/7 oxygen. That's very expensive to buy portable oxygen concentrators. They're about $3,000, even more, so we pay the money for buying machines like that. We have already more than 35 machines, and we supply them for the patients in Israel, not only for pulmonary hypertension patients, to all the pulmonary patients in Israel, and this really is a big project. We would love everybody to help us continue to raise money because all the time patients are calling me and asking for more and more portable oxygen concentrators. Like I said, we have 35 of them. That's not enough. My name is Aryeh Cooperman, and I’m aware that I’m rare.